Click on the image to go to the Audible page for this audio book. Old Man Coyote deliberately leads Bowser the Hound far away from Farmer Brown’s farm because he is tired of being chased. Bowser gets lost and injures himself during the pursuit. Help for Bowser comes from an unlikely source, which proves that there is some good in everyone. 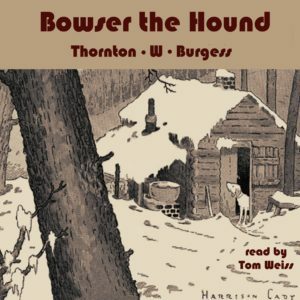 As with all Thornton W. Burgess stories, young listeners gain positive values while learning a great deal about the animals that share their world. Thornton W. Burgess was a conservationist and author of children’s stories. He loved the beauty of nature and its living creatures so much that he wrote about them for 50 years. By the time he retired, he had written more than 170 books and 15,000 stories for a daily newspaper column.